Woohoo Co-Review time, or conversation if you will and today we're here to talk about Laurie Faria Stolarz's Deadly Little Lies. But when Camelia and Adam start dating, a surprising love triangle results. A chilling sequence of events upturns secrets from Ben's past--and Adam's. Someone is lying, and it's up to Camelia to figure out who-before it's too late. Donna – I’m going to start with – oh how creepy. Seriously. I read both Deadly Little Secret and Deadly Little Lies back to back. In my basement. At night. Alone. Bad, bad, BAD idea. My phone rang and I jumped. High. But then again, I’m a big scaredy cat. What about you? Camelia’s being stalked. Ben is the mysterious new guy at school who was accused (and later cleared) of killing his girlfriend. Ben knows that Camelia’s in danger, but she isn’t sure she should trust him … despite their intense attraction. Ben seems hesitant to get close to Camelia, but when her life is threatened by the stalker, * SPOILER ALERTTTTTTTTTTT * Ben tells her he has psychometric powers – that he can psychically sense the past and future through touch. But it’s an ability he can’t control. He saves Camelia from the clutches of her twisted ex, but he doesn’t stick around because he couldn’t bear to hurt her. Frankie – Nice recap, Donna! Deadly Little Lies picks up 4 months later and this time around, Camelia is realizing that Ben might not be the only one with a psychic touch. Donna – Dun dun dunnnnnnnnnnnnnnnnn. Frankie—Camelia’s life long passion and talent for sculpting clay (she even gets to work at the local pottery store-so cool!) evolves into something unsettling. Suddenly she finds herself sculpting images that make no sense: a swordfish, eyes, a key….but upon each sculpture’s completion, she discovers the images signify something more ominous than artistic inspiration. Donna – And just like Deadly Little Secret alternates chapters with disturbing letters from Camelia’s stalker, the chapters of Lies also alternate. Except this time, every other chapter is a diary entry from Camelia’s aunt. Readers learn that her aunt also had this ability—except through painting. I like how Stolarz incorporates Camelia’s family into her story. Frankie—Yes! Camelia’s aunt tried to kill herself having developed the exact ability we see Camelia struggling through in book 2. This is wonderful for two reasons. One, the stakes are raised for Camelia’s well being. Will she be able to cope with her abilities, will they make her go crazy? But Laurie was clever here because as Camelia’s aunt struggles, her mother falls into a depression, worried and distracted over her sister’s well being. Which brings us to one of the classic YA motifs--the absent parent. Sometimes it’s frustrating to read about a character’s mom or dad who isn’t fully there without much reason other than to let the main character run around and get into trouble. But Laurie crafted Camelia’s parents so well, that they felt fully fleshed out, AND they had a reason for not always being too aware of what was happening in Camelia’s life. I’ll be very interested to see where Laurie takes us in book 3, both with Camelia’s power, and with the outcome of her aunt. Donna – I agree. I actually want to see Camelia’s aunt in book three. So far, she’s just mentioned in conversation, plus of course the diary entries from her teen years. And I believe that her aunt will play a part in the later books. I trust Laurie to follow through on this setup! Let’s talk about boys again. We like boys. Frankie—Oh yes we do! Well, there’s Adam, a boy who starts working with Camelia at Knead and though we’re rooting for Ben…Adam was a bit of fun. I mean all he wants to do is take Camelia out on dates and feed her pizza and coffee. Who doesn’t like that? Donna – Well yours would be vegan pizza, but heck yes! Adam’s a sweetheart, so we know right off there’s something significant about him. Laurie doesn’t just add a prominent character for no reason! And without spoiling anything, I will say that we do get our closure on that in the end. Frankie—And spoon!!!!! He knew he couldn’t be with her, but he just needed to be with her…it made me melt! M.E.L.T. MELT! Donna – Ok. Breathe. We get it. You = Wicked Witch + water. Ahem. Anyway. The plot of Lies moves quickly, just like Secrets. There are plenty of creeeeeeeeeeeeepy moments with mysterious voices and threatening messages that gave me chills. Laurie definitely has skills. Part of the reason the story moves so quickly is how polished her writing is. Frankie—Yeah, I’d say that Laurie’s writing is so subtle. It stays back in the shadows and allows her fun, suspenseful, romantic story to burst off the page. I found both books in this series to be un-put-downable. Each page left me desperate to know what would happen next. Donna – It’s a quick, absorbing read with a great balance of suspense and romantic tension. And I think we’re done our review! Frankie—No way, I did the promotion last time. Take it away, Donna. Donna—Ahem. [Flips hair.] Buy Deadly Little Lies. Romance + premonition powers + threatening letters = awesome. If you don’t read it, it’ll be one deadly little mistake. Frankie—Oooh nice one! Ok, we hope you enjoyed our co-review. 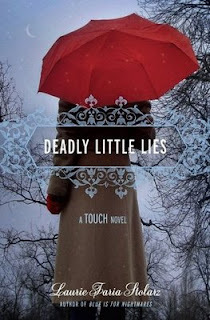 After you read Deadly Little Lies, stop by Laurie’s website HERE and tell her the FNC sent you! Shameless promotional postscript: For more co-review fun, check out the Frankie-and-Donna opinions on Hush, Hush, Shiver, and The Body Finder! What an awesome blog! So glad I found you all! Great review. The book sounds delicious. So many new commenters! Yay! Thanks everyone. Frankie and I love doing co-reviews, and we'll try to have another one up soon! Ohmygosh, this is the best review ever! I've never had a co-review done before. Squee!!! I love it - thank you so much! Can't wait for deadly little games! !